Established almost half a century ago, Carolan Coaches has grown from providing local services with one minibus to become one of the premier coach operators on the island. We dropped into the family business’ well-appointed Nobber, County Meath base and met up with hands-on proprietor James Carolan, who provided us with an insight into the impressive history and current well-being of this outstanding operation. 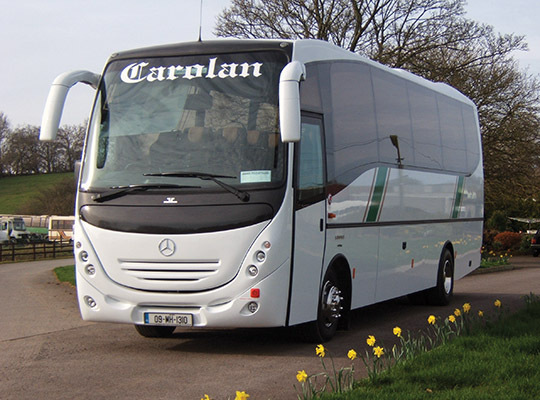 Carolan Coaches is a family-run executive Irish coach company ideally situated in a central location in the village of Nobber in County Meath, close to Kells, Navan and Slane and only 45 minutes from Dublin Airport. 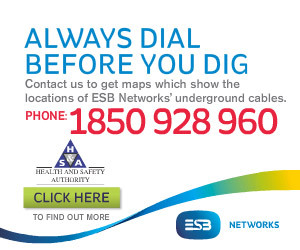 Proximity to both the M1 and M3 motorways ensures easy access to all the main arteries and cities in Ireland. With a flexible fleet from minibus to luxurious executive coaches, all needs are catered for, from package tours, school runs and sporting events to concerts and educational tours. During the intervening 32 years, James’ vision and hard work have been instrumental into growing Carolan Coaches into one of the most highly-regarded and in-demand coach operators in Ireland, now providing executive and economy coach tours of Ireland (and Britain) as well as a veritable host of other services. James started out with two HiAce minibuses and two 14 seaters; today he oversees a spectacular fleet of 21 units, including a new 32-seater which was added this year. “Inside my second year I bought a Ford Transit 14-seater followed by a 45-seater AEC coach, which was brought in from England. That was my very first coach and I ran that for nine-and-a-half years. Indeed, I still have it and hope to restore it one day if time and money allow.” From ’84 onwards, James began doing a lot of private hire work. He hasn’t looked back. With its head depot in Damastown Industrial Estate, Mulhuddart, Dublin 15, Coach Hire Dublin provides a complete coach hire transport service throughout the 32 counties. Between all operations, gainful full-time employment is provided to a team of 18 – not bad for a modest family-run business in a small rural village in North Meath! James’ two eldest sons are employed as drivers: Ashley – who served his time as a body builder with Ardee Coach Trim, converting vans into buses - also looks after fuel, vehicle washing and maintenance, while Jason is a fully-qualified mechanic. “We do everything in-house. We have two-full-time mechanics here as well as a full-time panel beater. We run an immaculate fleet, performing well at all times, and you have to keep on top of it,” James adds. Forty-eight years since his father first got behind the wheel of his VW minibus, James is pleased to confirm that business at Carolan Coaches is as brisk as it’s ever been: “This year started off very busy and it hasn’t slowed up,” he points out. Carolan Coaches also holds eleven school contracts – ten in Meath and one in Tallaght. To suggest that James Carolan is a hands-on owner would be an exercise in understatement. His passion for the business is evident in the long hours he continues to put in every day. He starts off at 5:50am daily and is always the first man into the yard. He fires up all the buses and the first one leaves the yard at 6:40. He then does his own school run from Nobber to Kells at 7:35 before returning to the yard for the dayand winding up at 6pm. On top of that, there are invariably a few things to be sorted out once he gets home as well! “Myself and Grace look after the logistics and all the bookings and we make sure that everything is running smoothly,” he states. Carolan Coaches is also the Meath members of the 32CC Group (32 Counties Coaches) – Ireland’s leading coach network offering high-quality services for group passenger transport. The 32CC Group is similar to a co-op, with members as shareholders and business generated distributed amongst the members. Since Day One, each and every booking has been treated as an absolute priority. That’s why Carolan Coaches continues to lead the way!